447.50 MSRP. 5% to 25% discounts available, depending on quantity ordered. Call 608-826-7400 for quote. 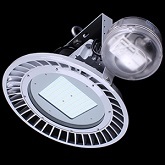 Advanced LED integration in a traditional, low-profile, lightweight, linear high-bay luminaire style; unique chromed reflector and clear lens cover provide smooth, even light; long 50,000 hour life; wide operating voltage with a high power factor; high shock & vibration resistance; 50%+ savings in energy consumption; mercury-free, no noise, no flickering, and no UV emissions. This product is DLC-, ETL-, and RoHS-compliant and fully recyclable. 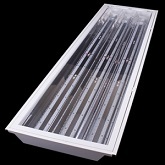 Click the button below to add the 150 WATT LED LINEAR HIGH BAY 120/277V to your wish list.